I found out about Global Game Jam a few weeks ago when a friend told me via Skype that we should go to this event. I went online to find more about it, and I was “Great, another hackathon”. I don’t like hackathons because I’m usually tired at the end of the week and after a few hours into the hackathon I’m losing my focus and I find hard to complete even simple tasks and all I want is to sleep. With all this in mind, I still said “Let’s go!” because what the heck? We asked another two friends to join us and they agree as well. But guess what? we were all programmers and it’s not that great to go to a hackaton without an artist or designer and that was the last day we could register. We asked a few artist friends to join us but no luck. The team size was not specified in the GGJ rules so we tought that we can eventually pitch our idea to some artists there. The name of our team is Alien Pixel and we have a logo :D.
Global Game Jam is not a competition. You have 48 hours to create or work on a game based on a specific theme. You can go anytime home, take a shower, sleep and come back. Friday at 4:00 PM we met and we went together at Crystal Palace Ballroom (the place where the GGJ was held in Bucharest, I think that usually weddings are held there, but anyway a super cool place). After we settled in with our laptops at a wedding table, the Game Jam started with some presentation from a few local tech angel investors and indie developers. I was literally shocked to find out how many indie game studios are in Bucharest and didn’t know about them. Then we met the mentors which gave us advices during the game jam. Finally the theme for this year was revealed ” What do you do now? ” and we started to put ideas on the paper. In this time we also talked with people from other teams, presenters and mentors. Social networking is super important at this kind of events. One or two hours later, the idea was clear in our mind and we decided that we don’t really need an artist for now. We wanted to create a mobile game where you are a cell (or a virus) and you have to eat other cells around you in order to stay alive. If you can’t eat in time, you will die from starvation. There are cells around you that can give you diseases and you have to find cure cells to survive. Of course there are other types of cells with different “properties” which can slow you, drag you, throw you etc. The fun fact is that you don’t know which cell is bad or good so “What do you do now? ” and you still have to eat to survive. We named our game Cellogy. After talking with mentors and other people from other teams, we found out that there are lots and lots of games like this so this is not something completely new but we didn’t changed our idea. So we have started working with the latest free Unity version (4.6.1). I have to tell you that just one guy from our team was experienced enough to work with Unity. But we all have technical background in this field of Computer Graphics. Time passes quickly and it is already 6:00 AM in the morning when we decided to go home and sleep and come back at 3:00 PM on Saturday. We returned at 3:00 PM and started thinking for the next steps. Although we went home and we all slept very well we were still tired and a task which I usually do in 1 hour, now I was able to finish it in 2 or 3 hours maybe. How great is that? Of course frustration came along and there was no fun and pleasure in doing this. But we had to keep going and we were so happy when something was working well and the game began to take shape. At some point in the middle of the night we realised that our artwork is a complete mess and as a player you don’t understand anything from the game. So we begin to redefine the artwork and continue to solve some bugs and add other features. At 6:00 AM in the morning we realised that if we go home we are not able to finish the game. So we decided to sleep there. Lots of people already gone home to sleep, others began to sleep there on the floor or on some chairs. I put together a chain of chairs and fell asleep. One of my teammates was sleeping under a table :). When I woke up, my hands and my back were so numb that I wasn’t able to move like a human for a few minutes. After that we ate and started working again. Somehow I wasn’t tired and I was able to focus again and solve some bugs. I can say that we managed to create an alpha version of the game. At 3:00 AM just before the finish time we presented our game to some mentors and other teams and the overall impression was good. At 4:00 AM we uploaded our project on the GGJ site and all teams started to present their demos in front of the jury and other teams. As I said this wasn’t a competition and everybody won knowledge and experience after the event. There were so many good ideas presented which can be easily be published after the event. However there was a voting system. Every team could vote just for one other team. The team with the higher number of votes won something. Unfortunately I didn’t see what because we didn’t win :D. I think that there were 18 teams at this Jam. We decided to finish our game and launch it on Android, iOS and Windows Phone ASAP. You can find our game here :http://globalgamejam.org/2015/games/cellogy and run it on Windows for now, however it’s very hard to play with a mouse. Maybe you can send us some feedback 😀 . Many thanks to my team colleagues: Andrei Ciobanu, Andrei Simion and Andrei Jifcovici. 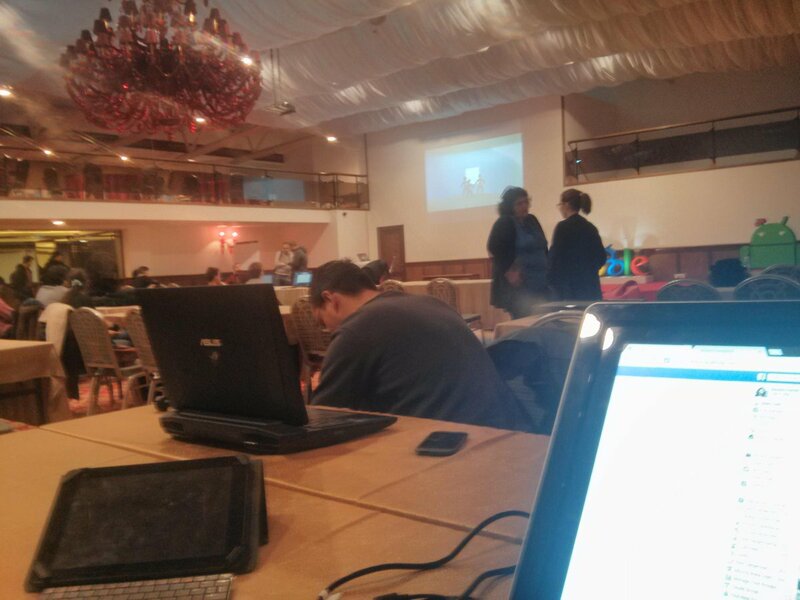 After this hackathon I will stay away from this kind of event for a long period of time….until next hackathon :P.